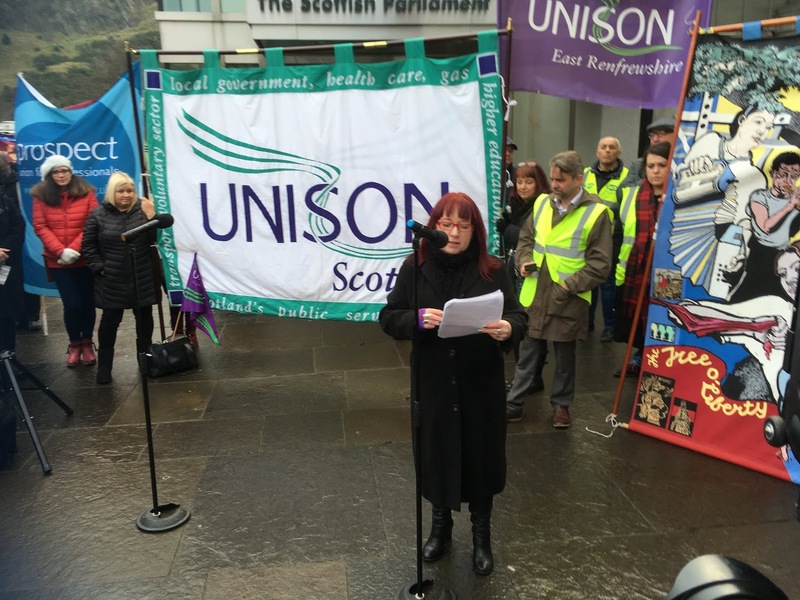 Branch secretary, Inez Kirk, who is also vice-chair of UNISON Scotland local government committee, spoke at a well attended STUC budget day rally at the Scottish parliament on Wednesday 12th December. 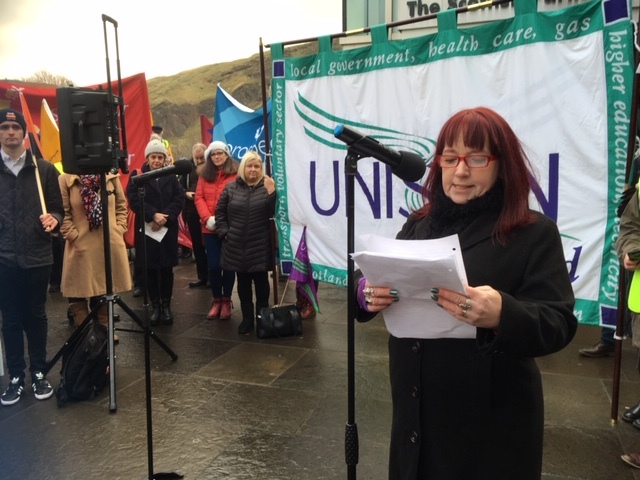 Inez sent a clear message to the Scottish government to start to value local government workers, particularly the low paid women workforce. Inez said: “Local government has taken the brunt of austerity. Derek McKay must redress the balance today and invest in local government so we can serve our communities. “The Scottish government must recognise the valuable contribution local government contributes to the fabric of our society. “For too long we have seen our local services cut, closed or sold off to the lowest bidder. “The cuts have been felt most acutely in local government. Nine out of ten public sector jobs lost since 2010 have been in local government. “What is even more stark is the effect on women in our communities and workplaces. “Three quarters of the local government workforce are women, predominately low-paid and delivering the services that vital to our society: caring for our older and more vulnerable people, providing support in our schools, ensuring the health and well being of everyone in our communities. And it is women who rely on these services. “Yet we continue to see these local services underfunded, cut to the bone or sold off – meaning even lower wages and less job security for the women providing the services but also those who rely on them. “Many local government workers have been forced into in-work poverty, and they rely on welfare benefits and food banks: families struggling to heat and eat in the 21 century. And that is public sector women workers. “Austerity has meant increased demand for local authority services, at same time as budgets have been slashed. “We say to our MSPs, when setting the budget: remember us. Remember the women who provide the services we all need. Remember the women who care, clean and educate. The women who do the clerical work in our councils. Remember all the local government workers who make such a valuable contribution to our communities.